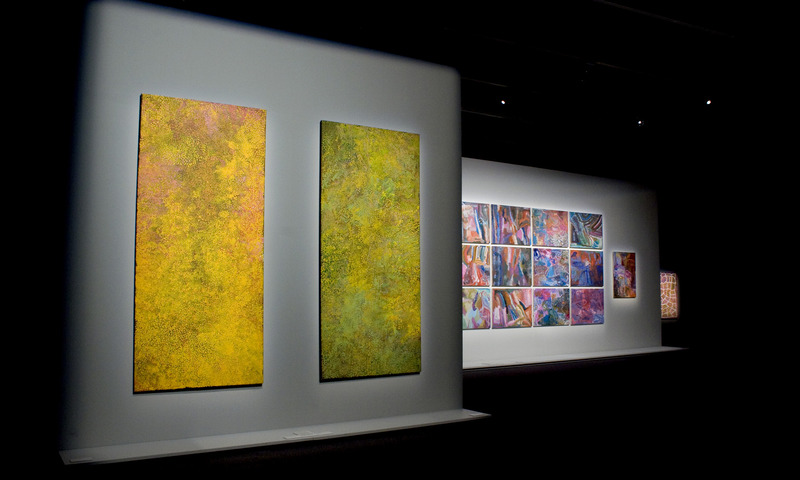 The exhibition brought together a comprehensive collection of 120 of Emily Kngwarreye’s works not seen together before. This collection told the story of one of the country’s greatest contemporary artists and gave insight into her life as a senior Anmatyerre woman and a lifelong custodian of the desert country that inspired her work. The exhibition design made the artworks the primary focus. The height in the temporary gallery of the NMA was utilised through the insertion of large clean display walls that allowed the scale and drama of the works to be comfortably viewed with generous ‘breathing spaces’. Smaller themed galleries, displaying a series of connected artworks, were also created, breaking up the large gallery space volume. Key objects were placed to act as visual magnets that drew viewers through the exhibition and into each of the gallery areas creating an atmosphere of anticipation and enticement.